“Mare” indicates it is a seaside vehicle, and “Lusso” makes it a high-line car with a roll bar. The Lusso is fairly customizable for the new owner, with a choice of virtually any color under the rainbow for both interior and exterior. 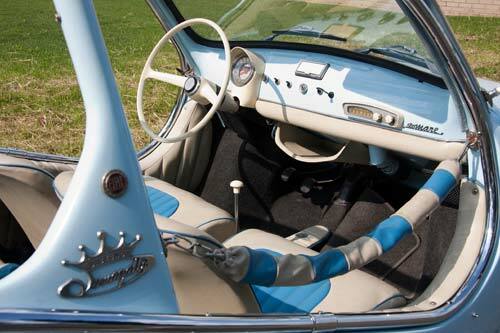 Prospective owners may provide a car, or Carrozzeria Holiday will source one for the conversion. Alloy body panels replace many of the donor cars’ panels, all “of the highest quality, hand-hammered by master Piedmont craftsmen, without the use of any molds.” Many of the new body panels are lined with sponge-foam for noise reduction. Lusso cars include the aforementioned rollbar, plus two-tone interior in choice of color and material: leather, vinyl, cloth, or canvas, or in any combination. The car comes with full road approval for four passengers. “The mythical Fiat 500 is so transformed it becomes ideal for both holidays and recreation.” The “lateral protection chains” along each side are wrapped in foam and vinyl, and are attached by carabiner. The Lusso also includes a five-piece top and side curtains, providing some protection should one encounter foul weather. 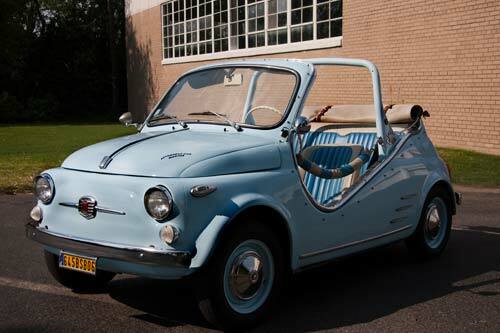 A base model Fiat 500 Mare sold at auction in Monaco in 2012 for $43,000. Signor Vernagallo confirms that this was his first Mare Lusso, number one, and as far as he knows, it is the only one in the Americas. While early records were not kept, Sig. Vernagallo performed this conversion around 1990. As Italian law dictates, the donor car's original registration is what is used for legal purposes.